FORMER Sheffield Steelers’ defenceman Mark Thomas says he and his wife Vicki have been “amazed” at the response by people willing to help them raise funds for breast cancer prevention. Thomas’s wife Vicki was diagnosed with the disease over nine weeks ago and is currently undergoing chemotherapy. To help raise funds for her chosen charity Prevent Breast cancer - a number of Steelers’ players will be taking part in a sponsored head shave after their Elite League game against Manchester Storm at Sheffield Arena this Saturday. Thanks to help from long-serving Steelers’ official David Simms, current players Ben O’Connor, Robert Dowd, Jonathan Phillips, Aaron Johnson and Tanner Eberle, will be stepping forward to have their heads shaved, along with Simms, Sheffielkd Arena boss Dom Stokes and Thomas’’s 10-year-old son Bailey. All money raised will go towards Prevent Breast Cancer, for which – through other fund-raising events – Vicki has already raised over £16,000. Former GB international defenceman Thomas, now involved with Manchester’s junior hockey programme, said he and his wife had been amazed at the response from people to support their aim of raising awareness and much-needed funding. “The actual diagnosis was in mid-September, then Vick started chemo within 10 days of finding out and we went from there,” said Thomas. “She’s had nine weeks of intense chemo and she’s having a week off for Xmas and then starts again on the 28th. “Ultimately we are fighting this with a positive attitude and I’m sure that she’ll get through it. It’s absolutely amazing the support that the people at the Steelers have shown Vick and myself. That place is obviously close to our hearts as we spent a lot of time over there and we still have a lot of friends over there, some still playing. We love that place. What we’re trying to do is turn a negative into a positive and to try and raise awareness, especially for younger women. Ultimately we are fighting this with a positive attitude. Another fund-raising event in connection with the Steelers has been scheduled for February 23-24 when Simms, Thomas, club photographer Dean Woolley, Neil Edwards and Elliott Hall and numerous others will walk – in two stages – from Sheffield Arena to Manchester Storm’s ice rink in Altrincham. “The chosen charity is Prevent Breast Cancer which looks at things like this in the way that prevention is better than cure,” added Thomas. “We’ve had a friend who went through this a few years ago and she’s an ambassador now for that charity. 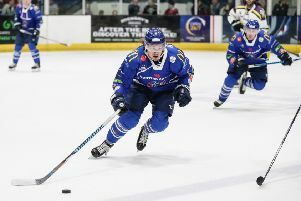 Jonathan Phillips, Steelers’ captain and a former team-mate of Thomas’s at both club and international level, said there was no hesitiation from himself and his team-mates in stepping up to help raise money. “As soon as Mark told us about Vick we all immediately wanted to support her and the family,” said Phillips. ON THE EDGE: Sheffield Steelers' captain, Jonathan Phillips. Picture: Dean Woolley.